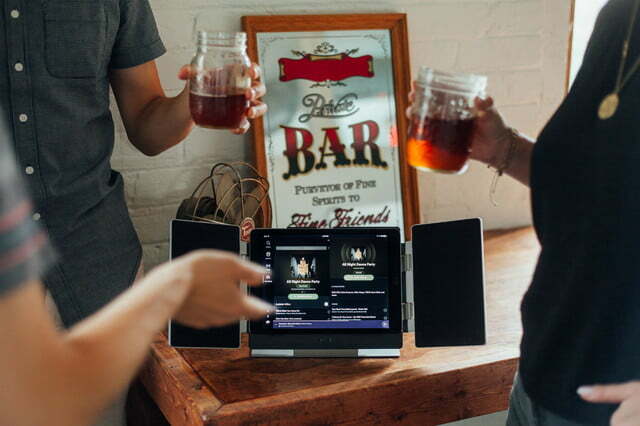 As Forrest Gump might say, tablets and streaming go together like peas and carrots. However, the iPad viewing experience often leaves something to be desired — especially when it comes to sound performance. 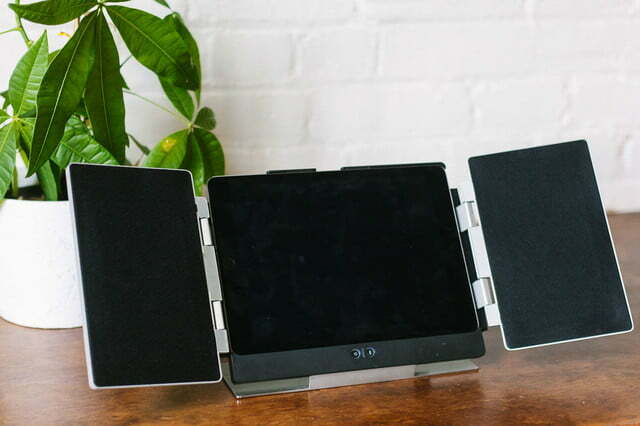 Tech startup OIO aims to provide a solution for your paltry iPad audio with the Amp, a Bluetooth stand/speaker set designed to turn your device into a mini entertainment center. The unit hit Indiegogo on Tuesday, just in time for the back-to-school rush. 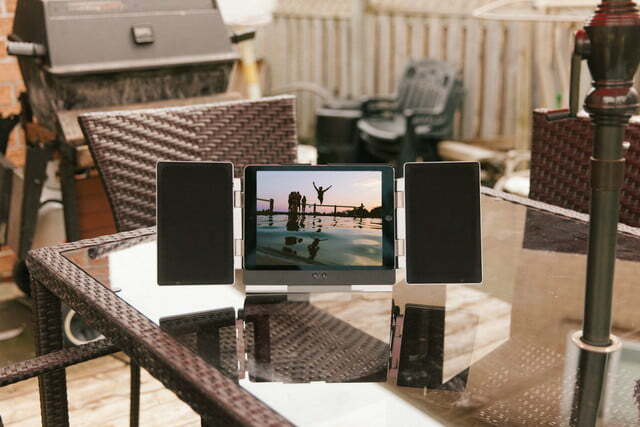 Crafted into a decidedly simple all-in-one design, the Amp’s dual electromagnetic speakers (called “electromagnetic exciters”) span the width of the screen to provide a full stereo field, yet their aluminum frames are thin enough to fold down into a relatively slim carrying case. The Amp easily pairs to your device with the press of the Bluetooth button on the front, and the system automatically pairs when powered on. 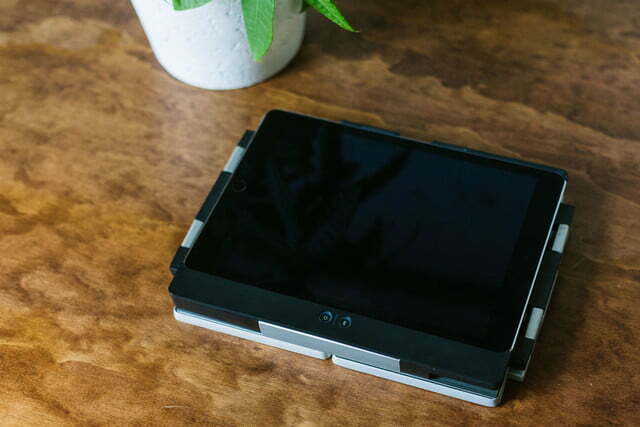 A handy kickstand on the back adjusts the viewing angle so you can set the unit to stream on a table or nightstand, while the rechargeable 900mAh battery is said to offer around seven hours of playback per charge. If the Amp looks familiar, that’s because the speaker already made a try at crowdfunding with an unsuccessful campaign on Kickstarter back in 2014. However, the team is a little older and wiser this time around, with production units at the ready for the Amp’s second launch. The unit has also recently been updated to fit the new iPad Pro, along with the iPad Air and iPad Air 2. OIO has also committed to fulfill all orders and bring the speaker to market, regardless of the outcome of its Indiegogo campaign. The Amp will ship in three colors, including Asphalt, Lion, and Periwinkle, starting as low as $99 for early backers. The retail cost is expected to be $249 once the campaign is over. As if to prove it’s ready to rock, OIO claims early backers will get their Amps as soon as September, and the Amp will show up on OIO’s website after the campaign concludes. We had a chance to check out one of the early models ahead of the campaign, which offered some impressive stereo imaging and also provided playback with virtually zero digital lag — something that we always worry about with Bluetooth solutions. However, our particular unit added a bit of a chorusing effect to the audio of streamed content from sites like YouTube and Netflix. OIO has assured us this is an anomaly, and the company will be sending us a second unit, so we’ll update this post once we’ve had a chance to verify that the issue is confined to our first example. As with any crowdfunding campaign, backers are advised to proceed with caution. That said, if the rest of the units work as advertised, the Indiegogo effort could be a great way to save some serious dough over the Amp’s retail price. Check out OIO’s freshly launched Indiegogo page here for more information.